Lieutenant John Hubert Trigg M.I.D. 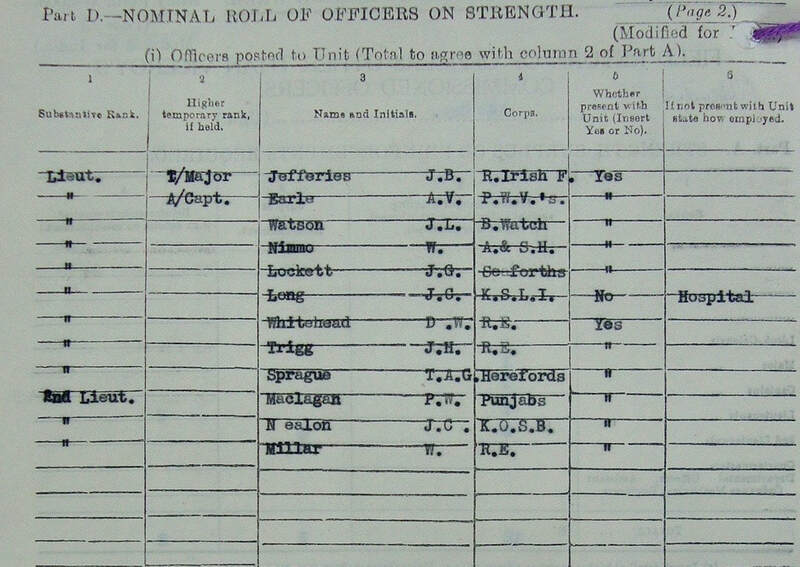 Approval is now accorded to the posting of Lieutenant J. H. Trigg (R.E) Royal Bombay Sappers and Miners (I.E.) Kirkee, to No. 142 Company, 77th Indian Infantry Brigade, Patharia. He should be instructed to report for duty as early as possible. As far as I can ascertain, John Hubert Trigg was born on the 24th July 1917 at Mansfield in Nottinghamshire. 137570 2nd Lieutenant J. H. Trigg was commissioned from the 141st Officer Cadet Training Unit (R.E.) on the 22nd June 1940. Having previously served in the Italian theatre during WW2, John arrived at the Chindit training camp at Patharia on the 9th November 1942. As one of around ten new officers attached to 142 Company in late 1942, Lt. Trigg was given command of his own Commando section. 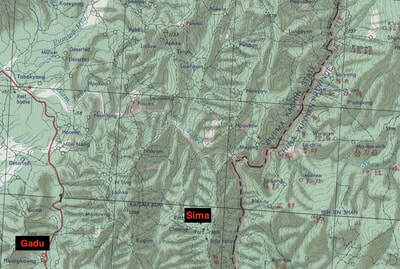 This section eventually became the Commando Platoon for Chindit Column No. 7 on Operation Longcloth. Once inside Burma, Lt. Trigg worked in close co-operation with the Burma Rifles section, commanded by Lt. John Musgrave-Wood. ​Unlike some of the other Commando Platoons on the first Chindit expedition, Trigg's men had no definite objective or pre-arranged target. They were used to lay booby-traps at locations judged to be frequented by the enemy and often scouted ahead of the main body of the column alongside Musgrave-Wood's men, searching out safe pathways and liaising with friendly Burmese villagers. 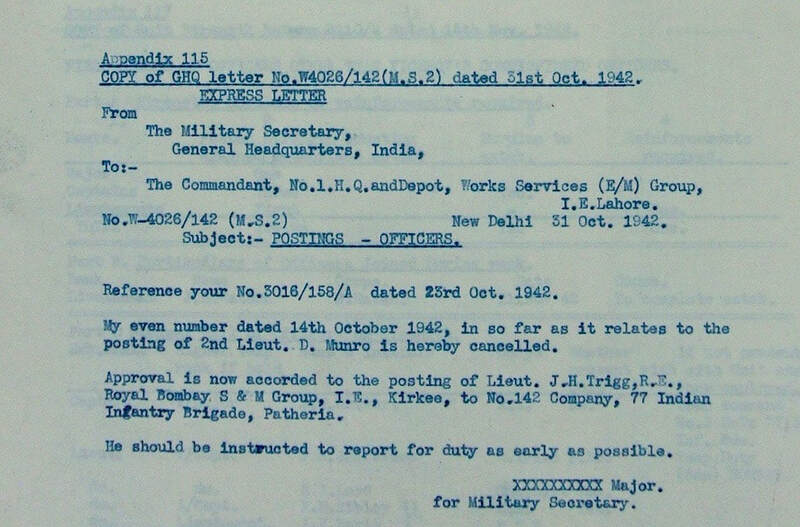 When the order to return to India was given by Brigadier Wingate in late March 1943, Major Gilkes, the commander of 7 Column, ordered Lt. Trigg to lead one of the main dispersal parties. 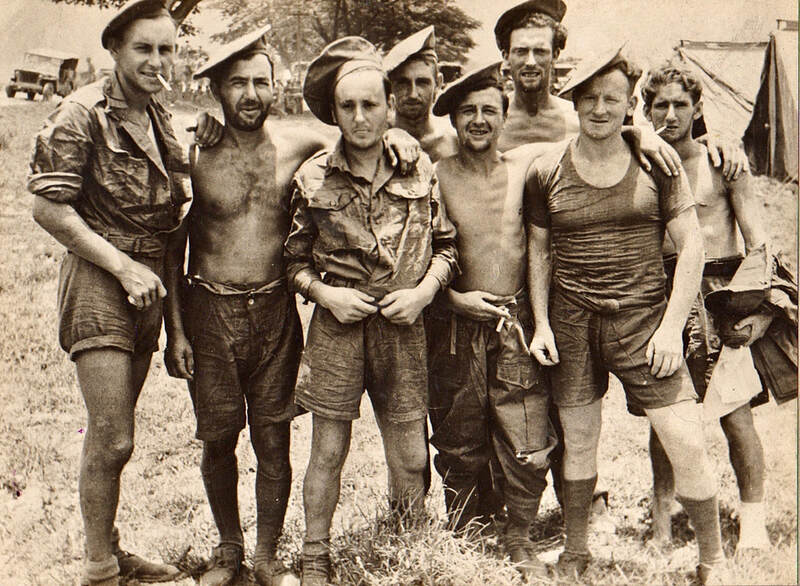 This group was made up of Trigg's commando platoon, plus some members of 5 Column who had become separated from their own unit after a battle with the Japanese at a place called Hintha. Another party from 5 Column, led by ﻿CSM John Cairns﻿ also joined up with Lt. Trigg for a short while around the 4/5th April. Column was divided today, Major Gilkes (group 1) took half the men east, intending to move out by the northern China route. Lieutenant Heald (group 2) took parties across the Irrawaddy, others went with Captain Cottrell (group 3), Lieutenant R. Walker (group 4), Lieutenant Musgrave-Wood (group 5) and Lieutenant Campbell-Paterson (group 6). Major Gilkes had always had it in his mind, that if the Chindit Brigade ventured across the Irrawaddy River during the operation in 1943, that he and his column would exit Burma on dispersal via the Kachin Hills and into the Yunnan Province of China. Lt. Trigg and his dispersal party accompanied Gilkes for the vast majority of this journey. Once again, Trigg and his men were asked to blaze a trail and move ahead of the column, often reaching villages and arranging local guides and much needed food supplies for the ailing and exhausted soldiers behind. 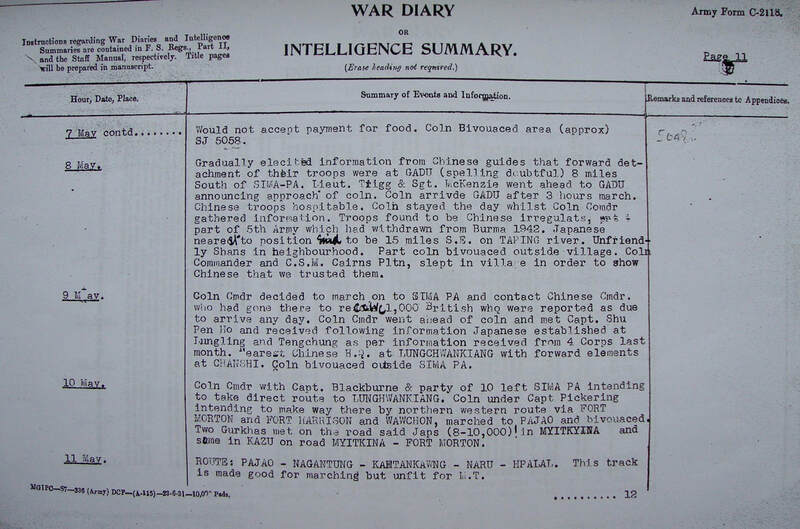 Gradually elicited information from our Chinese guides that a forward detachment of Chinese troops were at Gadu, eight miles from Sima-Pa. Lt. Trigg and Sgt. McKenzie went ahead to Gadu announcing the approach of the column. Column arrived after a further three hours march, Chinese troops very hospitable. Stayed the day whilst Column Commander (Gilkes) gathered information. The troops were found to be Chinese irregulars, part of the 5th Chinese Army which had withdrawn from Burma in 1942. Japanese known to be nearby, some 15 miles southeast of the Taping River. Unfriendly Shan tribesmen also in the neighbourhood. Part of column bivouacked outside the village. Column Commander and CSM Cairns and his platoon, slept in village in order to show the Chinese that we trusted them. 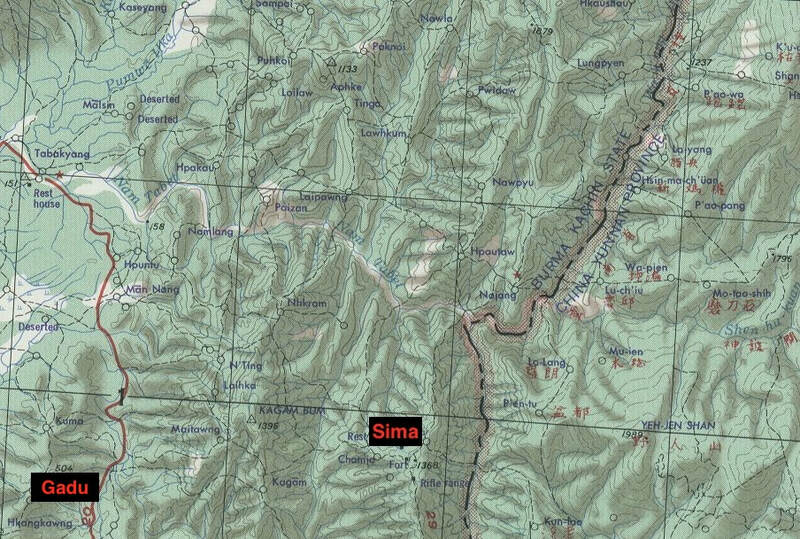 Seen below is a Gallery of images in relation to the first part of this story, including a map of the area around Sima-Pa and Gadu villages. Please click on any image to bring it forward on the page. Lt. Trigg was successful in getting his men out of Burma in 1943, eventually leading his party to safety via Yunnan Province and then having the luxury of being flown back to India in United States Air Force Dakotas on the 7th June. There was however, one incident that took place on the 8th April, which must have played on his mind as he began his well-earned period of rest and recuperation. 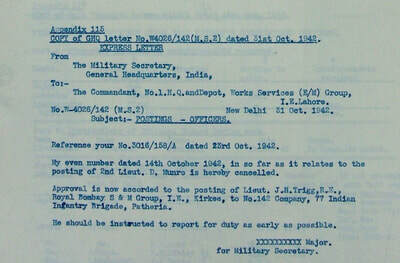 On the 8th April 1943, L/Cpl. S. Hunt requested that with a compass and a full set of maps, he be allowed to take the following men westwards to cross the Irrawaddy. L/Cpl. Desmond (5 Col. Commando), Pte. Samuel Craig (7 Col. Commando), Pte. 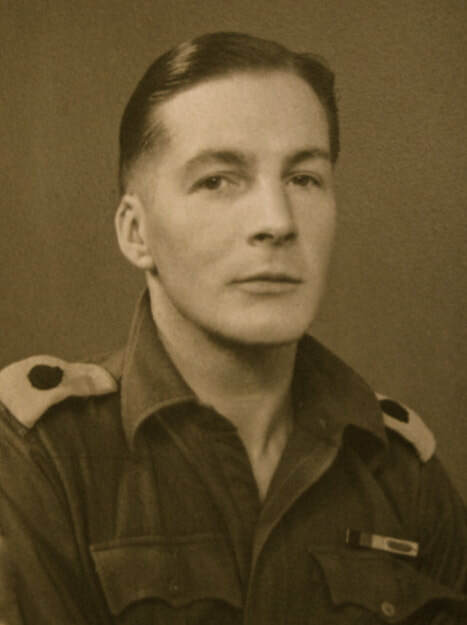 William Pearce (7 Col. Commando), Pte. Peter Knight (7 Col. Commando) and Pte. Stephen O’Connor (5 Col. Commando). The request was granted by the Officer commanding the Column. No news has since been heard of these British Other Ranks. The group had all been wounded to one extent or another and were also suffering badly from the monotonous diet of rice. They felt that the longer route out via Yunnan Province was now beyond them and their only hope was to turn west and head back towards the Chindwin. Sadly, none of these six men made it back to India in 1943. All six were captured by the Japanese over the coming days and weeks. Peter "Rocky' Knight died at the temporary POW Camp at Kalaw, Sidney Hunt and William Pearce survived a little longer, but eventually perished inside Rangoon Jail. Only Gerald Desmond, Samuel Craig and Stephen O'Connor survived their ordeal as prisoners of war and were liberated on the 29th April 1945. 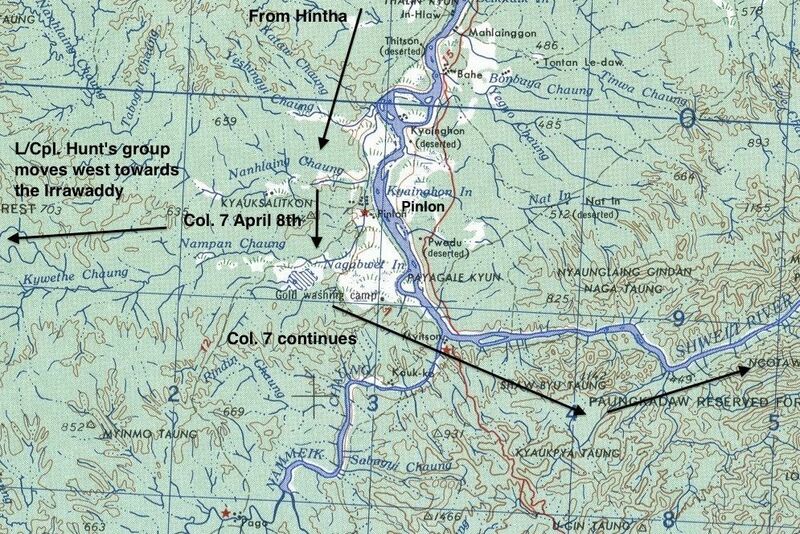 Seen below is a map of the area around the village of Pinlon, located on the western banks of the Shweli River and close to the Nanhlaing Chaung, the scene of L/Cpl. Hunt's request to leave the main body of 7 Column and move west towards the Irrawaddy. For his efforts on Operation Longcloth, John Hubert Trigg was Mentioned in Despatches. I cannot be 100% certain, but this may well have been the second time that he had received this award, the first M.I.D being granted for his service in Italy. 4690358 Acting Sergeant A. Hayes. This man came across to 142 Commando from the Bush Warfare School in Maymyo on the 31st July 1942. He had been based in Burma from before the war with the 2nd Battalion of the King's Own Yorkshire Light Infantry. Sgt. 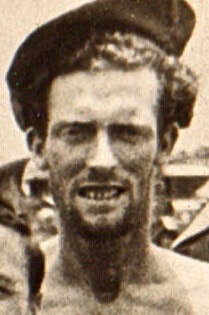 Hayes returned safely to India in June 1943. 4690270 Acting Corporal J. Jarvis. This soldier also came over from the Bush Warfare School on the 31st July 1942. Anecdotal evidence suggests that this NCO was lost to his section shortly after crossing the Irrawaddy River on the 29th March 1943. However, there is no record of his demise on the CWGC website and so we must conclude that he survived and made it back to India in one piece. 1880638 Lance Corporal Sidney Raymond Hunt of the Royal Engineers. This soldier was posted to 142 Commando on the 8th September 1942 at the Saugor training camp. As already stated, this man asked permission to leave Lt. Trigg's dispersal group on the 8th April 1943. He perished inside Rangoon Jail on the 2nd September that same year and was buried in the first instance at the English Cantonment Cemetery located near the Royal Lakes in the eastern sector of the city. 5250536 Pte. Frederick Clyronomides formerly of the Worcestershire Regiment. As far as I can ascertain, Fred was the only soldier of Greek origin to take part on Operation Longcloth. He returned safely to India in June 1943 and continued his career in the military, including serving during the Korean War in the early 1950's. ​5575640 Pte. Samuel Craig formerly of the Wiltshire Regiment. This soldier was one of the men with L/Cpl. Hunt and was captured by the Japanese on the 19th April 1943, close to the banks of the Chindwin River. Samuel survived just over two years as a prisoner of war inside Rangoon Jail. He was liberated on the 29th April 1945 at a village on the Pegu Road named Waw. 2574617 Pte. Harold Evans was the son of Samuel Evans and of Ada Rose Evans, from Brampton in Derbyshire. Harold was also a commando in Lt. Trigg's platoon, but had accompanied Lt. Musgrave-Wood on dispersal and had chosen to remain behind with another man, John Masland, who had developed a sceptic foot and could no longer march with the group. Nothing further is known about Pte. Evans, other than his recorded date of death, which was the 1st August 1943 and that he had been buried originally at the Mandalay Military Cemetery, before being moved after the war to Taukkyan War Cemetery, situated on the northern outskirts of Rangoon. 4468945 Pte. John Masland formerly of the Durham Light Infantry Regiment, was the son of Joseph and Ann Masland, from Blyth in Northumberland. He was also a commando in 7 Column during the first Wingate expedition. 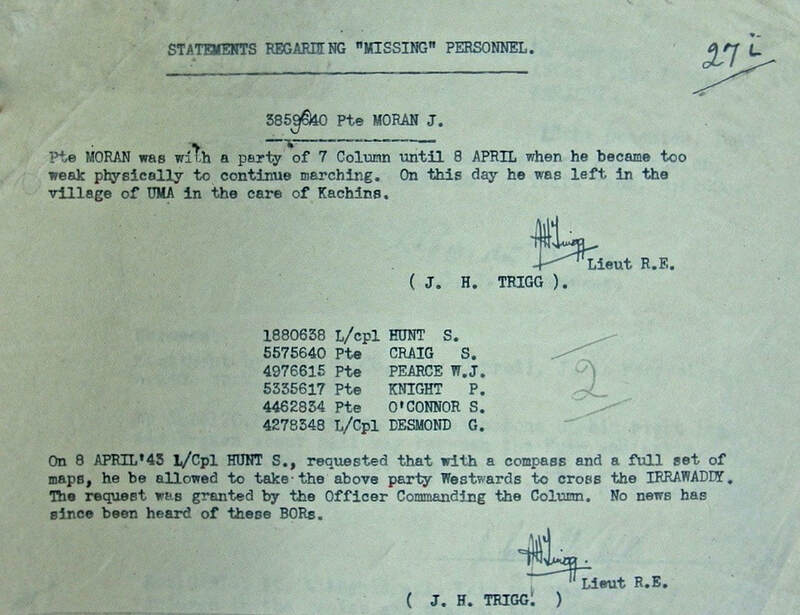 He is mentioned in a statement given by Lt. Musgrave-Wood as having developed a sceptic foot on the march out via the Chinese Borders and was left behind in the village of Sima on the 6th May 1943. He died sometime in late July 1943, probably in some form of Chinese Hospital. Sadly, his grave was never recovered after the war and for this reason he is remembered upon Face 5 of the Rangoon Memorial. This man was with 142 Company on Operation Longcloth and attached to No. 7 Column. He was a regular soldier and a medical orderly and was left in a village near the Irrawaddy River. His party under Lt. Rex Walker were informed several days later that he had died on the 9th April, suffering from appendicitis and malaria. Alan is remembered upon Face 5 of the Rangoon Memorial at Taukkyan War Cemetery. 4469219 Pte. Thomas Harrison formerly of the Durham Light Infantry Regiment. A member of 7 Column Commando on Operation Longcloth, this soldier returned safely to India in June 1943. ​4466861 Pte. James William Redpath formerly of the Durham Light Infantry Regiment. Another member of 7 Column Commando on Operation Longcloth, this soldier also returned safely to India in June 1943. 4468217 Pte. Absolom Woolley was another former member of the Durham Light Infantry Regiment. Absolom, another commando from 7 Column succeeded in returning to India in June 1943. 4466920 Pte. Nicholas Brady Walton was with 7 Column on Operation Longcloth and returned safely to India after the expedition. He gave at least one witness statement on his return in relation to Pte. Alan Frederick Forth (see above). ​5184234 Pte. A. Rees formerly stationed with the Gloucestershire Regiment in Burma, was posted to the 13th King's on the 13th November 1942 at the Saugor Camp. This soldier was posted to the Commando Platoon for 7 Column returned safely to India in June 1943. Nominal Roll, 7 Column Commando Platoon. 5571466 Lance Corporal W. Phelps formerly of the Wiltshire Regiment. This soldier was posted to 142 Commando on the 1st July 1942, whilst the unit was still stationed at its original barracks in Jubbulpore. He was a member of Lt. Trigg's commando platoon and returned safely to India after Operation Longcloth. 3856940 Pte. 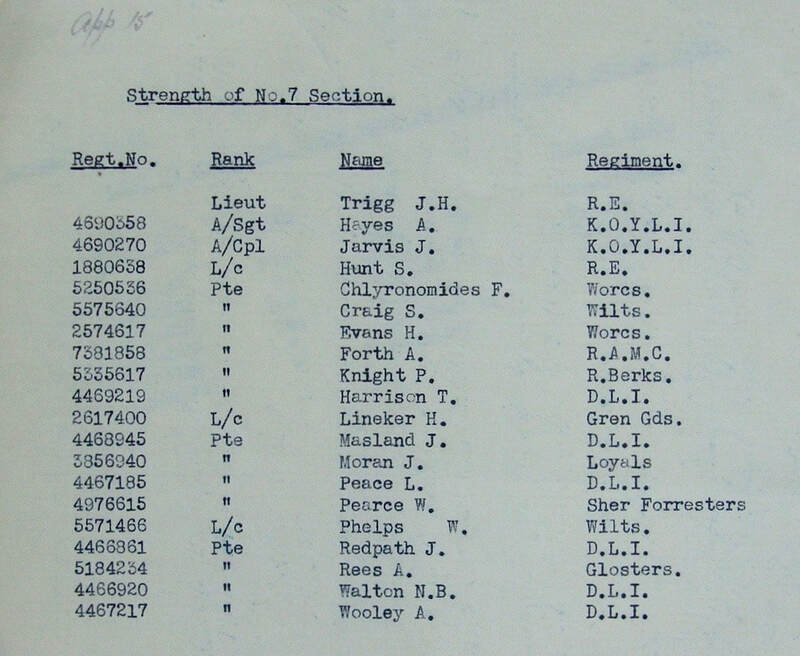 Joseph Moran formerly of the Loyal Regiment, was transferred to the 13th King's on the 30th September 1942 and was posted to the commando section for 7 Column under the leadership of Lt. J. Trigg. He was captured by the Japanese on the 29th June 1943, having previously been left in the Burmese village of Uma on the 8th April, suffering from a gun-shot wound to his side. Joseph was liberated on the Pegu Road, alongside 400 other POW's from Rangoon Jail in late April 1945. This soldier's hometown was Liverpool. He was originally with A’ Company of the 13th Battalion, the King’s Regiment. He was somehow separated with a number of other men from No. 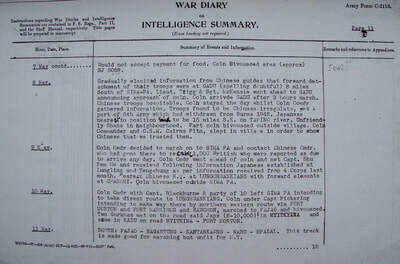 5 Column, sometime in late March 1943. He became attached to No. 7 Column. During an incident with the Japs, he was, along with twenty-one other men, separated from the main body of No. 7 Column. This party, of which I was a member, was led by Lieutenant Trigg of the Royal Engineers and officer commanding of 142 Commando detachment for No. 7 Column. King was found missing from the line of march. He was in a very weak condition and was suffering from malaria. I would say this was a matter of two or three days before No. 7 Column had it's first ration dropping in the Kachin Hills and I think, the last dropping before I too fell out from the line of march sometime in April. According to the CWGC records, James King died on the 24th April 1943. His grave was recovered after the war and he is now buried at Taukkyan War Cemetery, located on the northern outskirts of Rangoon. 2617400 Lance Corporal H. Lineker. This soldier was a former Grenadier Guardsman and a member of the Commando Section for 7 Column in 1943 (see nominal roll above). L/Cpl. Lineker became part of Lt. Musgrave-Wood's dispersal group in early April 1943 and exited Burma with this officer. 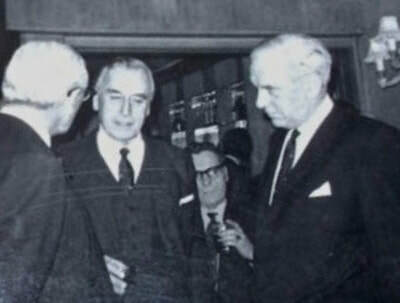 After his return to India he gave witness statements in relation to Harold Evans and Leslie Peace. 5335616 Pte. Peter Edwin Knight. Formerly with the Royal Berkshire Regiment before being transferred to 142 Company 13th King's in July 1942. I met him whilst a prisoner in a place called Kalaw, he died after being there for about two weeks, the cause of his death I could not say for sure. However, the Japanese had been experimenting on us all the time and I saw them give him about six needles and the next morning he was dead, he was called 'Rocky' Knight to his friends. 4976615 Pte. William Pearce formerly of the Sherwood Foresters, before being posted to the Commando Platoon for 7 Column in the early autumn of 1942. William was one of the breakaway group led by L/Cpl. Hunt on the 8th April 1943. He became a prisoner of war shortly afterwards and sadly perished inside Block 6 of Rangoon Jail on the 17th September 1944. He is now remembered at Rangoon War Cemetery. 4467185 Pte. Leslie Simnet Peace died on the 25th August 1943 and is now buried at Taukkyan War Cemetery, located on the northern outskirts of Rangoon. He had been with Lt. Musgrave-Wood's dispersal group that had attempted to reach Fort Hertz in the far north-eastern corner of Burma in late April 1943, but had to drop out of the line of march. 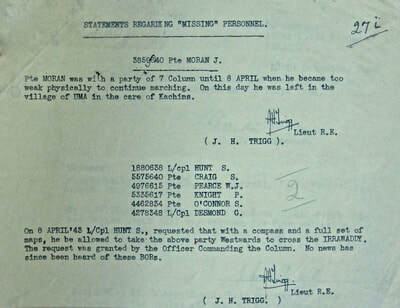 One witness statement suggests that he, much like Harold Evans had chosen to remain with Pte. John Masland when this soldier could no longer walk. 4462834 Pte. 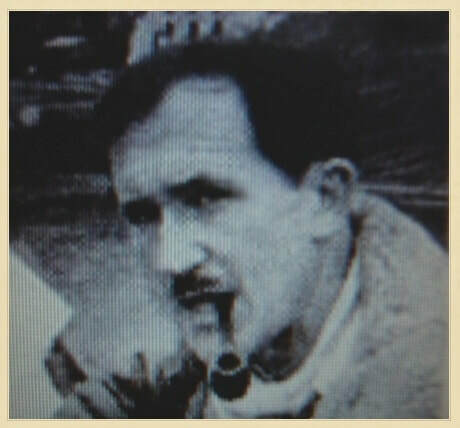 Stephen O'Connor was originally with 5 Column Commando on Operation Longcloth. He was one of the 100 or so men from this column to be separated from the main body of Major Fergusson's force on the 29th March 1943, after a battle with the Japanese at a place called Hintha. 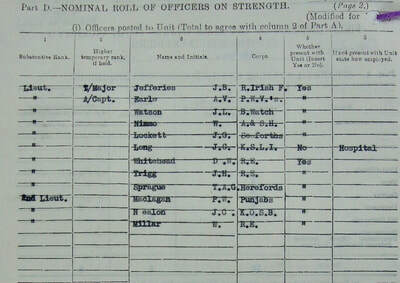 He later joined up with 7 Column, but chose to leave Lt. Trigg's dispersal party alongside L/Cpl. Sidney Hunt on the 8th April and was captured by the Japanese on the 4th May. Stephen survived his time as a prisoner of war and was liberated on the 29th April 1945 at the Burmese village of Waw. 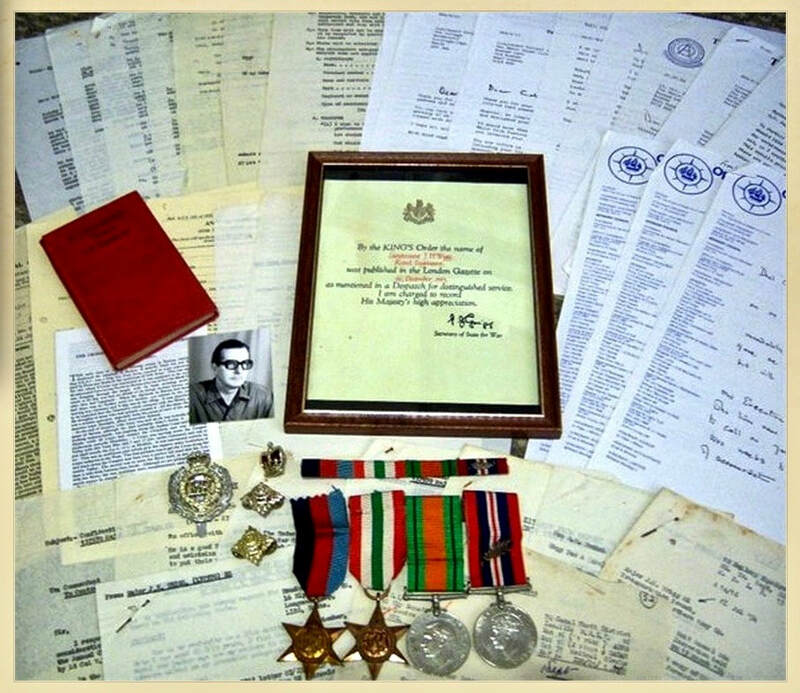 Some paperwork and medals belonging to John Hubert Trigg. These were seen for sale on line in 2011. 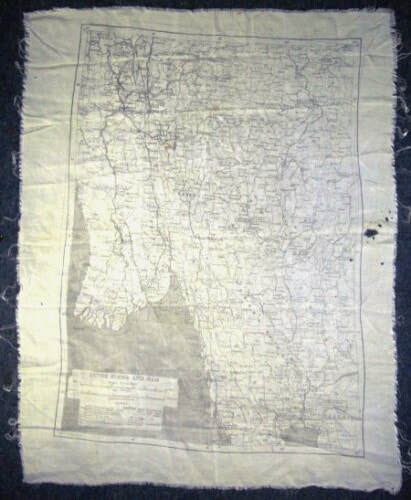 The silk escape map reputedly belonging to Lt. Trigg on Operation Longcloth. 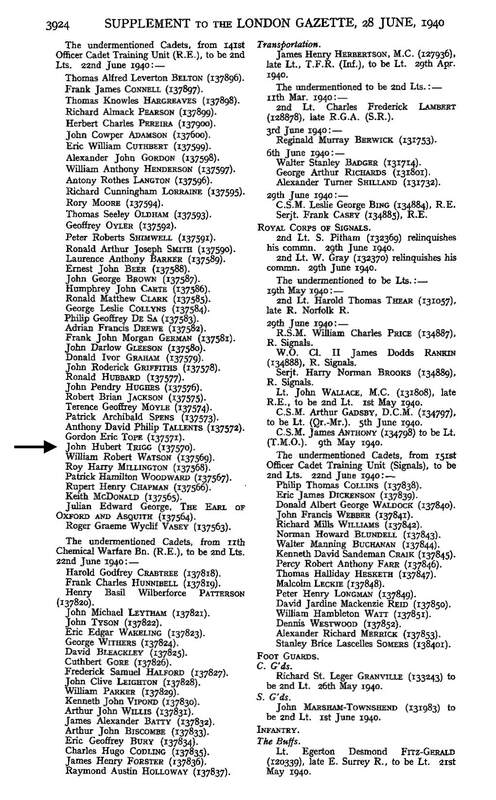 On the 10th May 1947, a supplement to the London Gazette announced that 2nd Lieutenant (War Substantive Captain) John Hubert Trigg, was to move from his status of Emergency Commission (WW2) to that of full Lieutenant, with seniority from the 1st October 1941. In September 2009, some of John Trigg's WW2 militaria came up for sale on eBay. The auction was separated into four lots: his RAF escape map, issued to all Chindit officers before the expedition in 1943, some papers and letters, including a M.I.D. certificate, some miniature medals, including a Burma Star medal and an album of photographs depicting his career in both the British and Indian Armies. All four lots sold for substantial sums of money. Some two years later in August 2011, other items appeared for sale. On this occasion they included a greater number of personal letters, photographs and paperwork pertaining to Lt. Trigg's service during WW2. Added to this were a set of full-sized medals which included the Italy Star, but no Burma Star medal and a medal ribbon bar. Once again the lot included a M.I.D. certificate, this time presented in a brown wooden frame. Sadly, on neither occasion was I in a strong enough financial position to bid on any of these items. I have just found details about my father on your website, his name was John Hubert Trigg, but was known to his family as Tim. 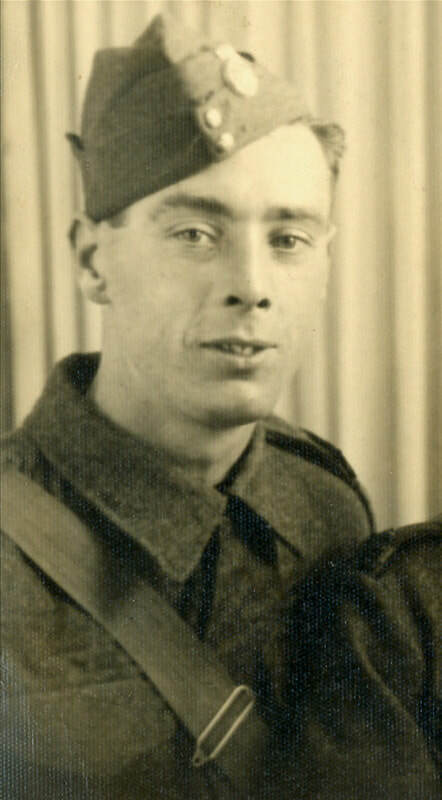 My Dad did not talk about his wartime experiences, which seems very common and so the information you have put together is very interesting for my brother and I to see. Dad was a lovely gentle man who possessed a great sense of humour and a passion for chocolate. My late mother's paperwork is kept in boxes at my house, so I will take a look through to see if there is anything which might be of interest to the Chindit Society and the website. Best Regards, Liz Veitch. Copyright © Steve Fogden, September 2017.